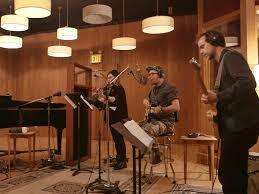 Early on a spring morning in Manhattan, Sufjan Stevens, Bryce Dessner, Nico Muhly and Nadia Sirota gathered at Reservoir Studios in Manhattan to play a song first performed five years ago and an ocean away. “Mercury” is the closing track off Planetarium, a song cycle about the planets by Stevens, Dessner, Muhly and James McAlister. The work was originally composed on commission for the Dutch concert hall Muziekgebouw Eindhoven, and first performed there in 2012. Five turns around the sun later, Planetarium will arrive in recorded form on June 9 via 4AD. “Mercury” is one of the most intimate songs on the record, a quality that’s emphasized by its spot just after the 15-minute, ambient, electronic epic, “Earth.” Where the record’s other songs foreground synthesizers and spastic electric drum samples reminiscent of 2010’s The Age of Adz, “Mercury” largely rests on Muhly’s gentle piano work and Stevens’ beautiful vocal. Where once, in the original live performances, the song swelled to a cinematic rush on the order of Illinois, it’s now spare and elegant. Its warm intimacy is all the more apparent in the group’s live performance, which features Dessner of The National lightly doubling on guitar Stevens’ wordless refrain at the song’s close. You can watch a video of the interview — and listen to the full-length interview — on All Songs Considered. Am also a member to this great site,,,wordpress.com,,i have my own website in it,,which is there below..nice meeting you here,bye. Real pretty and space-like, love him! Silence and music are definitely ways to express something magical or inexplicable, Beth. Smile inducing. Thank you, Beth.